Former First Lady Michelle Obama was one among many high-profile figures who were at Temple University on Wednesday to celebrate local college-bound students at College Signing Day. Michelle Obama told college-bound Philadelphia high school seniors Wednesday about when she applied to universities. Her counselor advised her not to set her sights too high and warned that some of the schools on her list were out of her reach, the former first lady said. "There are always haters out there telling you what you can't do," Obama told the students celebrating College Signing Day. She did not heed her counselor's words. Instead, she attended Princeton University and Harvard Law School. Decades later, she accompanied her husband to the White House for two terms. "I know that you are me," Obama told the crowd. "And if I can be standing here as your forever first lady, then you can do anything you put your mind to." The label, "forever first lady," came from actor Nick Cannon, who along with other A-listers joined Obama at the fifth annual celebration, the first in Philadelphia. The event, held at Temple University, was not always, or often, solemn and serious. After Obama shared her thoughts, she broke out her dance moves alongside actors Robert De Niro, Bradley Cooper, Zendaya and Rebel Wilson as they all advocated for higher education. Obama pioneered the tradition in 2014 to congratulate young people who have chosen to further their education through a professional training program, community college, four-year institution or the military. She closed the festivities, but a long list of known names preceded her. Karlie Kloss, Jesse Tyler Ferguson, Ciara, Camila Cabello, Malcolm Jenkins and other major entertainers and athletes lent their support to the college-bound students. Johnathan Phan, a first-generation college student headed to Temple, said he's excited about the experience that wasn't afforded to his parents and other relatives. He also seemed enthusiastic before Obama's speech. "I had a little crush on her when I was little," Phan said. Obama previously has hosted College Signing Day events in New York City, Detroit and San Antonio. 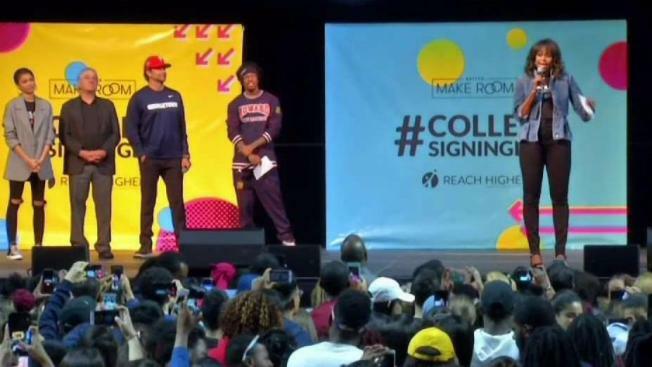 Across the United States, 2,000 other College Signing Day events celebrated high school seniors continuing their educations after graduation.